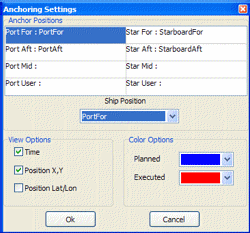 In addition to the default features, tools and utilities found in Viking, a special modules interface is supplied. Using this interface many specialized and customized modules can be added to the Viking system. The anchoring module was originally developed for offshore vessels, enabling them to carefully plan and execute the most complex anchoring situations, found in the maze of pipes and cables on offshore sites. Since then the anchoring module has also found use in complex dredging operations with vessels using up to eight anchors. 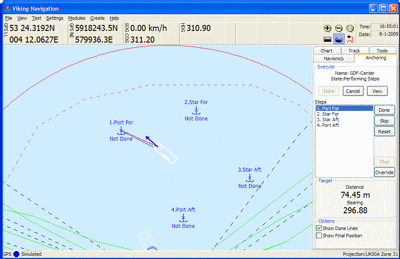 Here plans can be made for the positioning of large dredging pontoons supported by a network of tug boats. 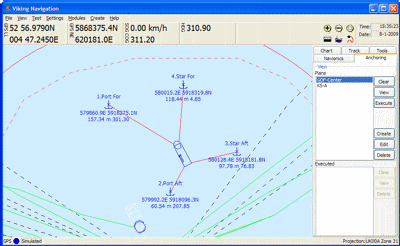 Vessels using the anchoring module have found the module to be a major time saving feature. Once a plan is made using the graphical, on-screen editor, further work is fully automated by the press of a button.